Floral Arrangements | Flowers in a Box for Delivery in Auckland New Zealand. 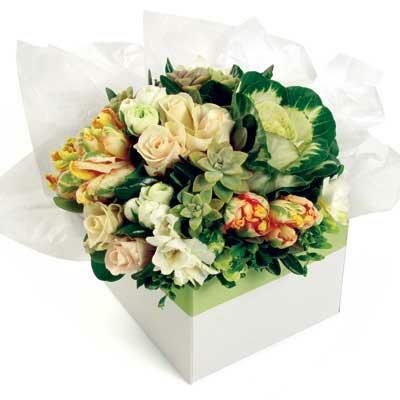 An arrangement is a more compact style of flower design, made in a container or gift box using Oasis wet floral sponge. They are a perfect flower gift for hospitals and retirement homes as they fit perfectly on a side table or coffee table. They are also very popular to send for sympathy and funerals or to the bereaved at home. A boxed arrangement does need to be watered every day to keep the Oasis sponge wet. Like all flowers, they will always last longest, if kept out of direct sunlight, heat, and drafts. The perfect floral centrepiece for the Xmas table, we have either the pretty White Christmas box of flowers, or the traditional Table centrepiece. The perfect way to share Christmas dinner went you can't be there to join the party. Floral Arrangements - Skilled Floristry at its finest. An arrangement really is a traditional floral skill, the art of working into the Oasis sponge gives the florist control over the placement of flowers into the design, and uses all the principles and elements of design we learn during our N.Z. Professional Florist training. Trust Best Blooms to send a beautiful flower box arrangement in Auckland Today for you.